The 2011-12 rainy season — which ran from July 1, 2011 to June 30, 2012 — has come to an end with less than impressive numbers, according to figures compiled by the National Weather Service. None of the six key sights where the weather service records long term precipitation reported above average rainfall. The season that starts today could be different. The U.S. Climate Prediction Center says that an El Nino appears to be developing in the eastern equatorial Pacific. If the periodic climate change system continues to strengthen, it could lead to above average rainfall this winter in Southern California. A recent report published in the Journal of the American Medical Association, based on data from 2008, shows a few interesting changes. 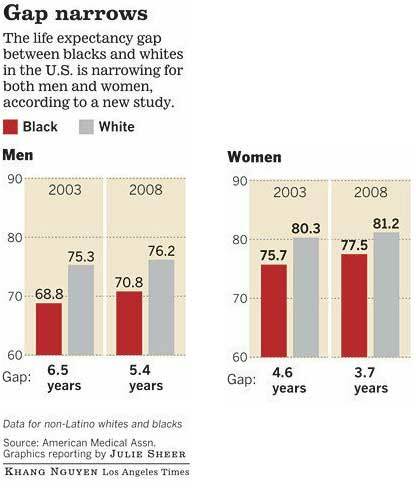 African-americans are catching up in terms of long life, though still behind. Both white men and women increased their average life expectancy by 0.9 years. African-american men increased theirs by 2 years and women by 1.8 years. The strange thing for me (a white male), in that 5 year period my own life expectancy rose nearly a year. If that continues, doing a little math, I can expect to live for 85-87 years (on average). That’s pretty cool. Where are you on global pay scale? Do you earn more or less than the world’s average wage? The average wage, calculated by the International Labour Organization, is published here for the first time. It’s a rough figure based on data from 72 countries, omitting some of the world’s poorest nations. All figures are adjusted to reflect variations in the cost of living from one country to another, and as Ruth Alexander of BBC radio’s More or Less programme underlines, it’s all about wage earners, not the self-employed or people on benefits. Click to view the interactive version (shows wage of each country). Continue reading Where are you on global pay scale? Posted on June 10, 2012 Author robotchampionCategories defaultTags average, bbc, cost of living, dollars, global, interactive, labour organization, monthly, more or less, pay, pay scale, radio, wage, wage earnerLeave a comment on Where are you on global pay scale? A look at the average annual hours worked per person in selected countries puts South Korea top with a whopping 2,193 hours, followed by Chile on 2,068. British workers clock up 1,647 hours and Germans 1,408 – putting them at the bottom of the table, above only the Netherlands. **The United States is at 1,695. Greek workers have had a bad press recently but, as we reported in February, they work longer hours than any other Europeans. Their average of 2,017 hours a year puts them third in the international ranking, based on figures compiled by the Organisation for Economic Co-operation and Development (OECD). “…the US is the only developed country that has no legal or contractual or collective requirement to provide any minimum amount of annual leave,” he says. The UK, in contrast, is subject to the European working time directive, which requires at least four weeks of paid annual leave for every employee. via BBC – Who works the longest hours? Here is a screenshot of all 34 OECD countries. Click to the BBC to see the interactive version that shows each country’s hours worked. The most popular media outlets by state – where is Fox News/NPR popular? Forbes and Bitly pulled together a data set highlighting the most read newspapers by state. In some places certain media is read more than others. Can you guess where NPR is the most popular, or where Fox News is read the most? I’ve always wondered why USA Today was so popular, well, 13 states have it as their favorite, above all other sources like N.Y. Times, NPR, & Fox. After that, The Huffington Post is the second most loved. Screenshot below, or view the interactive map on Forbes. Continue reading The most popular media outlets by state – where is Fox News/NPR popular? Posted on June 4, 2012 Author robotchampionCategories defaultTags average, bitly, by state, forbes, fox news, huffington post, interactive map, media, media map, media outlet, msnbc, news, news source, newspaper, npr, NY Times, shared, state, the onion, united states, us, USA TodayLeave a comment on The most popular media outlets by state – where is Fox News/NPR popular? This year’s surge in gasoline prices appears over, falling short of the record highs some had feared heading into peak summer driving season. 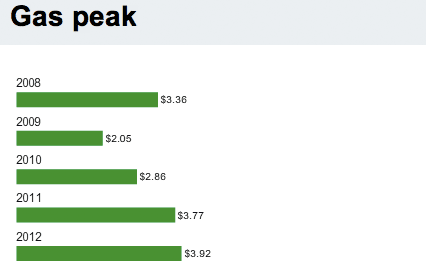 Prices have held at a national average of $3.92 a gallon the past week, below 2011’s $3.99 high and July 2008’s record $4.11. DeHaan said the national average could dip to $3.70 a gallon by early May. High in national average each year. 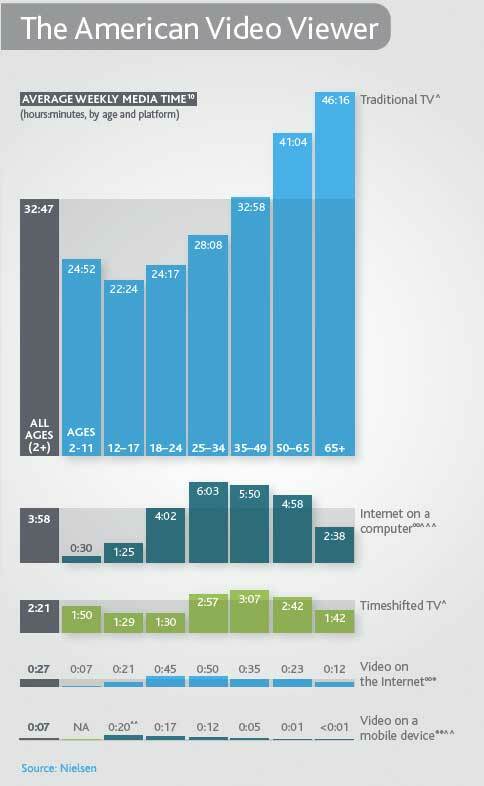 How many hours of TV, internet video, TiVo, and mobile video do Americans watch? What age range are you in? Posted on February 19, 2012 Author robotchampionCategories defaultTags age, average, consumption, data, hours, internet, media, mobile, nielsen, statistics, TiVo, tv, videoLeave a comment on How many hours of TV, internet video, TiVo, and mobile video do Americans watch? I bought my 2004 Acura RSX as a new car back in November of 2003. 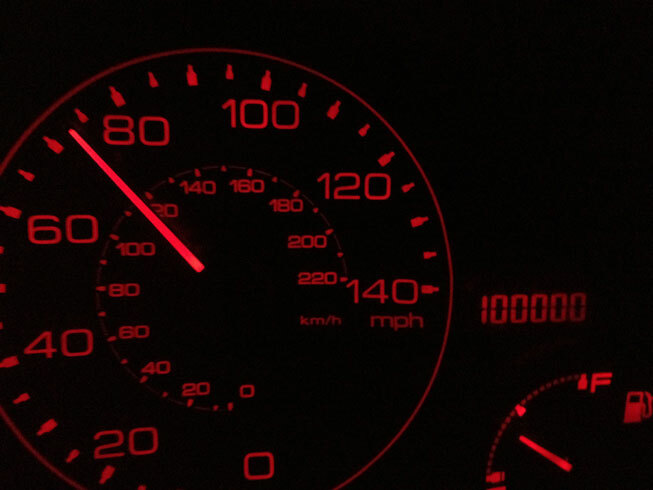 In the eight years since I have driven 100,000 miles. That’s 12,500 miles/year which is 31% below the national average of 18,000 miles/yr. It also includes four cross-country trips from Los Angeles to Washington DC (10,560 miles). 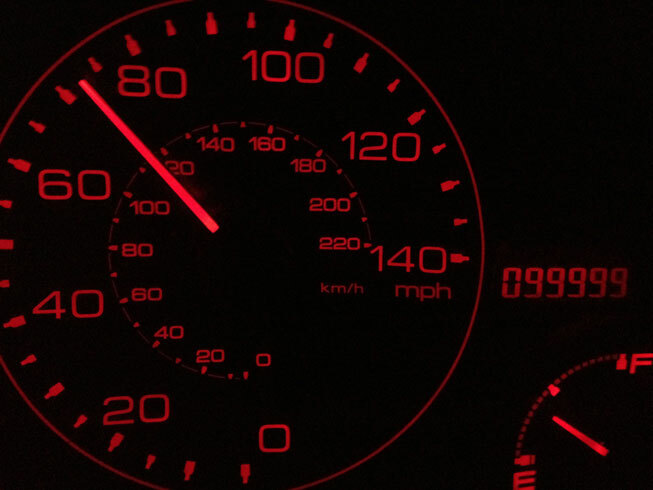 Of which, the milestone was reached on the fourth trip on a night drive through Marshall, Illinois. I still love my car but sure hope to drive much less in the future!